As one would expect to see monkeys and elephants like Thailand, I did not manage to see a single one. All I managed to see is an injured deer, and maybe a rooster and its family. Nevertheless, I wasn’t expecting a lot from the natural view in Khao Yai. Although I do love a good hike in the wild, the air was fresh, the weather was cooling, but the view wasn’t fantastic. The Ban Tha Chang spring area was quiet and filled with fallen leaves from the trees. Hardly, anyone was inside the spring area. As for the National Park, I would have thought I would be able to see a gorgeous sea of green, but I see a sea of brown. I do like the walk to the Heaw Suwat Waterfall, as I do get to hike a little. Every step I take to the waterfall, I hope that the view was worth it. Guess what? No. It wasn’t worth the view. It was the smallest waterfall that I had seen so far. It was a nice photo spot, but it wasn’t worth the effort to go all the way there. Nevertheless, I was happy to burn some fats that day. I also observed that my mum is no longer young, or has the same amount of strength as me. It wasn’t easy for her to go hiking. She would need a short break once in a while. Age is catching up, and both of us are no longer young. Life has a funny way of reminding you such things. However, I am thankful that she could still walk and climb up the stairs. Is it worth it to go to Ban Tha Chang spring, Khao Yai National Park or the waterfall? No, it’s not worth it at all, unless you are a nature lover. I spent almost half a day at these 2 places, and I don’t feel like I had seen or done much. Regardless, if you wish to visit these places, I would recommend that you wear a pair of good shoes. The sunflower field at the Jim Thompson Farm. 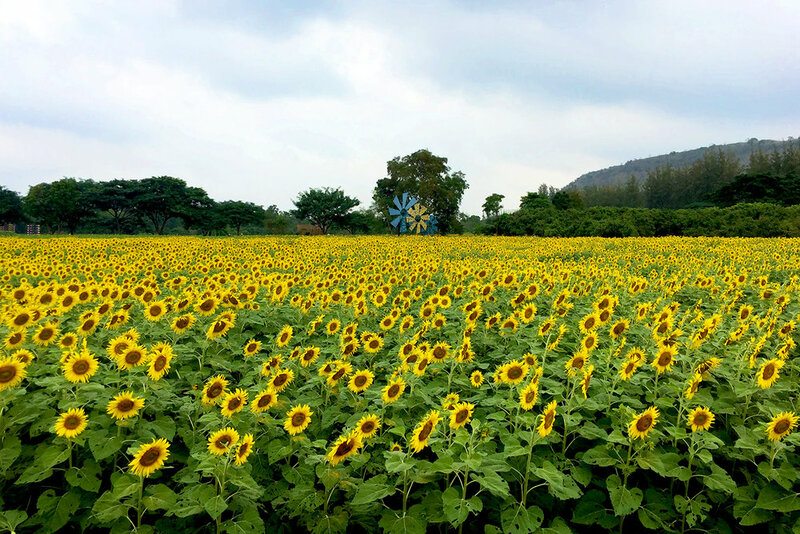 If you asked anyone who visited Khao Yai, they would recommend you to go to the sunflower field. The sunflower fields are one of the highlights in Khao Yai. I agreed with the statements to. It is definitely in my list of must-go if you are in Khao Yai during the season. The sunflower field that the driver brought us to was relatively big. There was a small area whereby the locals were selling local products and sunflower seeds too. The sunflower seeds were very fresh. I would totally recommend you to try the sunflower seeds here. Anyway, so my mum and I decided to venture to a quiet corner of the sunflower field. It was tough venturing through the area. It’s not easy to find a proper route, and you have to walk through patches of tall grasses and soil. On top of that, all I can see are bees and more bees. These are not something that I enjoyed, but I plucked up my courage and braved through it just so to take a few good photos. It was totally worth it! The sun is so glaring at the Manee Sorn Sunflower Field. Sunflowers do have some cheerful effect on me. I like staying in the field and admired sunflowers. Although the bees could be quite distracting, I tried to remain as still as possible to not attract their attention. Is it worth going to the sunflower field? Absolutely! When you see an area of sunflower, somehow you would naturally feel happier. Moreover, this is a great photo stop. The sunflower field that I visited was Manee Sorn Sunflower Field. There’s one in Jim Thompson Farm as well. I had previously written about Day 1 in Khao Yai. There are 2 parts to it, you can read them here and here. For the first 2 nights in Khao Yai, we stayed at Phuwanalee Resort. We booked a 3 bedroom Thai villa with them. We decided to stay here due to the location and the price of the resort. This is one of the rooms of our villa. It’s an open concept 3-bedroom villa. There are 2 room with king size bed, whereby 1 of the room is a honeymoon suite. The third room is a twin room. All the rooms were separated, meaning all of us can have the place all for ourselves. As for the living room, it’s outdoor. Or instead, there is no living room. There are dining tables, sofa and chairs available. It’s a charming place to chill in the morning and at night. Twin Room; I stayed in this room. Our villa is a beautiful building by itself. It’s made of wood. The interior seemingly belongs to a vintage hut. It’s a different vibe as compared to a modern hotel. Nevertheless, the room is well equipped with air condition, air dryer, mini pantry and etc. Resort’s Map; there is a waterfall in the resort! The entire resort is surrounded by plants! The staff took great care of the guests too. They put insect repellant at every other corner of the resort to ward off the mosquitos. Could you believe that there is a waterfall in the resort? Yes, there is one, and I only found out about that the next day. We didn’t have time to have a tour of the resort, but I dare say that the resort is relatively huge. It would be good to save some time to explore around this resort. Would I stay in this resort again? Yes. Would I recommend this resort to anyone? Yes. Now, let's us continue on with the tour! For the second stop, we went to the Yellow Submarine! Are you thinking about a yellow submarine? Initially, my mum thought that we were going to see a yellow submarine, but she was so wrong! Yellow Submarine is a cafe situated in Khao Yai! The cafe was surrounded with greens, and the cafe adopts a rustic style in the interior. It has a lovely contrast; it like a fusion between nature and the modern world. It's a perfect spot to take your OOTDs! We did see a lady taking her photos from the main entrance and various corners of the cafe. Of course, one has to order a yummy toast in a cafe in Thailand! I ordered the Black Honey Toast and Iced Thai Tea with Hokkaido Milk. My family is not a fan of dessert, so that's all we ordered. First, let's talked about the Iced Thai Tea with Hokkaido Milk. This has to be one of the best Thai Tea I had during the trip. It was not too sweet for my liking! Iced Thai Tea usually is very sweet because condensed milk is added. Instead of using condensed milk, Hokkaido Milk was used. The tea blended well with the milk. The overall taste was not too sweet, and it was still smooth. Moreover, the server presented the tea and the milk separately; thus you could customise your own drink! I added in the entire bottle of the milk, and it did not overpower the fragrance of the tea. Black Honey Toast with Vanilla Ice-cream! Next, the Black Honey Toast! The toast was actually charcoal bread. It was toasted to perfection. It was crispy on the outside and fluffy on the inside. It was still hot, so the vanilla ice-cream and the warm toasted went very well together. Even without the ice-cream, the toast went well with and without the honey. Personally, I like this. It's a tasty dessert. It wasn't too sweet or buttery like the toasts by After You. I am missing these 2 dishes while writing about them. Damn... someone brings me back here! Look at it smiled for the camera! Anyway, there is an adorable dog in this cafe. When we reached the cafe, the dog came out and peeped at us at the entrance. Then, it went back to rest in the restaurant. When we were returning back to our car, he walked us out. He even decided to join in to take a photo with me. The dog was like a friendly service crew too! Then, we went to check in to our resort at Phuwanalee Resort. I would leave the review of this hotel for the next post. So, stay tuned! After a short break at our hotel, we decided to go for dinner. As we are feeling slightly tired, we decided to go somewhere nearby for dinner. We went to Krua Khao Yai Restaurant, and the first thing we did was to order one coconut for each of us. There was a promotion that day. We bought 4 coconuts and got 1 free. We ordered a scrambled egg, fried fish, broccoli, shrimp cake and more. I didn’t eat much as I don’t usually eat dinner. However, I would say that the dinner was pretty average. It was not bad, but it wasn’t great as well. 5 coconuts for 4 people! Well… I took 2. This dish was pretty good! I can have this all for myself. After dinner, we went back to the resort to chill. That’s the end of day 1 in Khao Night! It’s a pretty short day. Recently, I went to Khao Yai, Thailand for a short holiday. Honestly, I am quite excited about this trip as I wanted to go to Khao Yai, as I kept hearing about it for a few years. On top of that, I would really love to embrace the sight of the sunflowers. This was also the last trip of the year. It's also one of the rare occasions that I went on the trip with my family to Thailand. I decided to pen this down while my memory is still fresh. We booked the air tickets and accommodation relatively late. Hence, the overall price of the air tickets and accommodation were on the higher end. On top of that, most of the hotels and resorts were fully booked! It was quite hard to find one during the dates that we were there. Nevertheless, we managed to have everything settled 2 weeks before the trip. On the day of the day of the trip, we took Thai Airways to Bangkok. We hired a car charter with a driver for the entire trip. I would suggest doing this as the driver would drive you not just to Khao Yai, and it's definitely easier to get around the town. There is no public transport in Khao Yai, and I didn't see any tuk tuk while I was in Khao Yai too. The drive from Suvarnabhumi Airport to Khao Yai was slightly less than 3 hours, as we managed to get a really smooth traffic that day and we even had a short stop to buy some snacks. 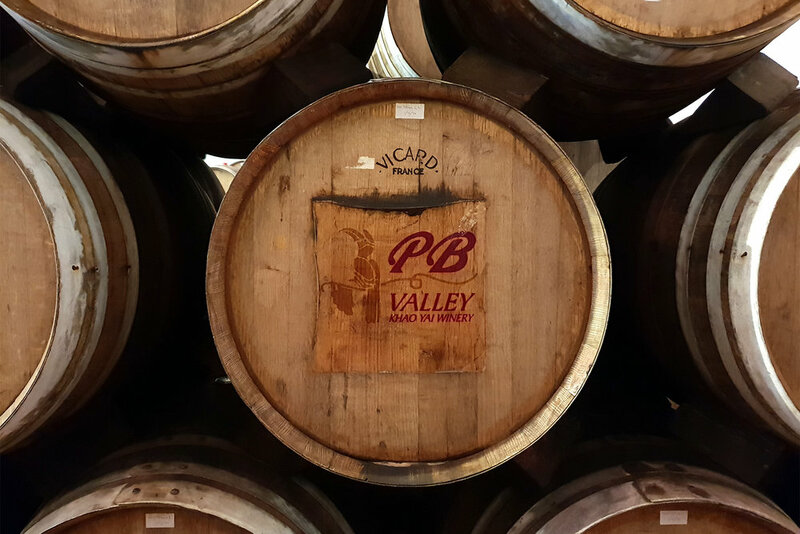 The first stop of the trip was a visit to PB Valley Khao Yai Winery. Initially, we wanted to take a tour around the winery first. However, we reached 20 minutes late to the place, the buggy had driven off, and we could only join in for the next tour(, provided there were seats available). One important point to take note is that if you have to book the trip 1 week in advance! They had a huge notice placed at their counter. We were lucky to be able to join the next tour partly because our driver was able to negotiate with the saleslady. (That's another bonus for hiring a private driver.) To be on a safe side, it best to book the tour in advance and be there early as they would start to push the crowd to take the buggy half an hour before the start of the tour. Anyway, since we have some time to spend, we decided to have lunch at their restaurant first. The Fried Pork Knuckle was the first dish that was served to us, and we were famished; hence we devoured it when it arrived. Honestly, it was pretty good. It reminded me of Germany, but it wasn't as good as theirs. The meat was a bit dried. However, I have to comment on the mashed potato and the sauce. The combination of these 2 was perfect. Honestly, that was my favourite part of the dish. We were pretty hungry and ordered quite a number of dishes. I don't eat spicy food hence I ordered a salmon fillet for myself. The salmon was cooked nicely. You could see a tinge of slight pink when you sliced the meat. The texture of the fish was not too hard. Most importantly, this serving was good enough for 1. Anyway, Khao Yai is not surrounded by ocean. Hence, their seafood is slightly on the pricier side. Like most Thai food, the Seafood Pad Thai was slightly on the sweeter side. The prawns were tasty. I am not a fan of Thai Food, so I don't really fancy this dish. This was the highlight! The drink was refreshing in a good way. They mixed strawberry, homemade grape juice and soda together. The result was perfect! It's a great drink to have at the end of a long ride on a hot and sunny day! There were sliced strawberries in the juice as well, which I enjoyed eating! I am a fan of strawberries. These weren't all the dishes that we ordered, but as I said I am not a fan of Thai Food and the meals were spicy. Hence, I would not be discussing much them. Anyway, you could enjoy a 10% discount if you are going on a tour here. The ticket comes with a 10% voucher, so remember to use it! Now, let's talk about the tour! All of us took the buggy on tour around the farm. The tour has 3 stops; grapevine farm, production factory and a shortstop for wine tasting. At the first stop, we get to have a 10 minutes photo stop at the grapevine farm. There was only a small section of the farm opened for our viewing. The grapes were pretty tiny. It's smaller than the grapes that you see in the supermarket. At the second stop, we went to the production factory. Honestly, there was nothing much to view. Most of the guests were looking forward to the last stop; wine tasting! To my utter disappointment, the wine was not fantastic. It can't be compared to French/New Zealand and Australian Wine. However, their grape juice tasted so much better, and that was the saving grace for the tour. Honestly, I find the trip a little underwhelming, but it is still a good education tour of wine in Asia. Put on sunblock as the sun is really glaring! I would continue Day 1 in another post, so stay tuned!